I know, I know, I still haven't posted about our trip to Thailand. Sorry! I did just go through my pictures this weekend, and gosh - we really had a fantastic time. The food was amazing and loads of fun to relive. Lots of obsessing about everything Thai is coming your way - I can't wait to share it all with you. The one thing you've already heard about (and heard about, and heard about) from our Thailand adventure is yam som-o, pomelo salad. Ever since I had it that first time, at an absurdly named but very tasty restaurant in Bangkok called The Foodie, I've wanted to recreate it at home. When yam som-o is done right, it's the perfect balance of spicy, sour, salty, sweet, crunchy, and juicy. It's downright addictive, and after falling hard for it that first day in Bangkok, I sought it out everywhere we went. The version at The Foodie was heavy on the crunch: I think the garlic and shallot were very, very lightly battered before they were fried. There were also a lot of fried herbs in it, which are hard to do in the US since kaffir lime leaves don't grow on trees down the street. And their dressing was heavy on the tamarind and heavy on the palm sugar, which feels a bit like cheating (sweet salad!) but made stuff even more impossible to stop eating than it would have been. The few street establishments where I had yam som-o made a much different rendition, with more (and fresher) pomelo, less sugar, and more herbs, none of them fried. The dressing at these street spots had tamarind and some palm sugar, but it also had coconut milk and loads of lime juice, which made the salad taste more like salad. Pomelo wasn't in season when we were there; I can only imagine how much more of it I'd have eaten (and how much better?) if it were. So when I returned to DC to find that my local grocery had just gotten pomelo in, I pounced, splurged on three, and started testing. 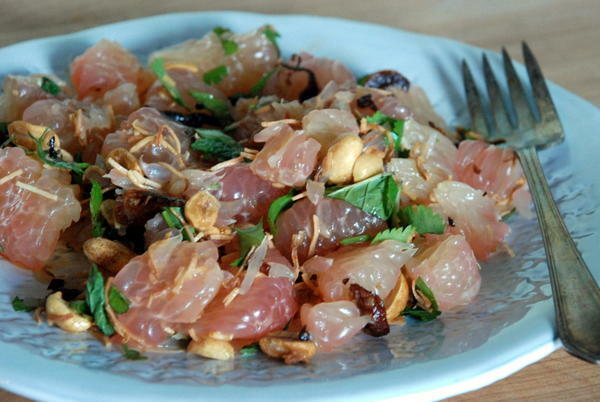 If you've never worked with pomelo before, you're in for a treat. 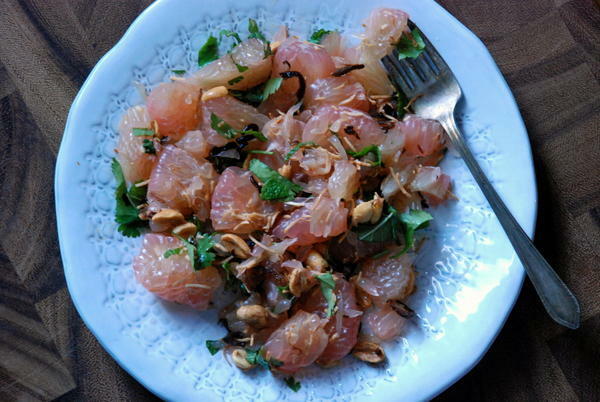 Pomelo is similar to grapefruit, but much firmer and more fragrant. It's got a super-thick rind and pith, so you'll be surprised to find that, despite its large size, the fruit inside resembles a grapefruit. 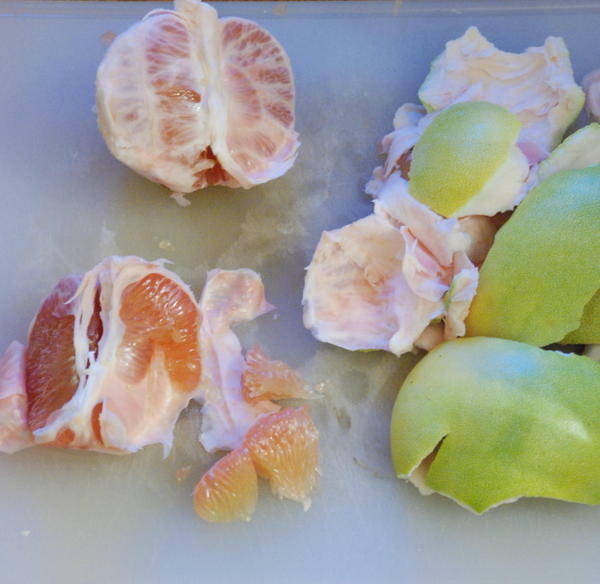 For yam som-o, you'll be removing the membrane of each section, leaving naked segments of pomelo that can be broken into whatever size you like. This takes a bit of patience. Turn on some good music, get into a zone, and you'll be done in no time. I'm told traditional yam som-o is made with large pieces of fruit, so I broke each segment into about three pieces, but if you want more of a shredded salad texture, you can do that easily. The balance of both the salad ingredients and the dressing is key, and it changes from salad to salad. I don't know how sweet your pomelo is, or how sour your tamarind. To make this salad taste right, you'll need to really get in there, tasting and adjusting as you go. You'll also come to find your preferred balance of fruit to herbs to nuts to crunchies. I've included my proportions below, but do feel at liberty to increase or decrease portions if, say, you really love toasted coconut or don't much care for cilantro. The balance is important, but it changes from salad to salad and from person to person. Go find yours. Heat the oil in a small saucepan over medium heat and set a paper towel onto a large plate. You want the oil hot, but not too hot. If it shimmers, turn down the heat a bit. Add shallots, and cook until light to medium brown, about 8 minutes. If shallots sizzle when you drop them into the pan, turn down the heat immediately to prevent shallots from burning. Toward the end of the cooking, watch carefully: shallots go from lightly toasted to burnt very quickly. Combine the dressing ingredients in a jar and shake vigorously until sugar dissolves. Taste and adjust, adding more lime, sugar, tamarind, soy/fish sauce, or chile as needed. Set aside. Combine the salad ingredients in a large bowl, or apportion them onto individual plates. Top with some of the fried shallots and garlic. Drizzle dressing overtop, starting with about half of the dressing and adding more as needed.